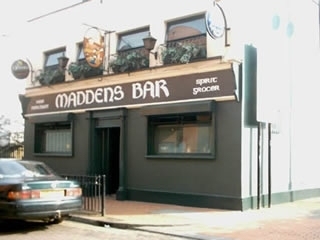 Maddens bar, found behind Castle Court shopping centre, is a Traditional Irish bar. Have you got Google Earth on your computer? If so, then download the Google Earth view of Maddens. Is this the wrong position for Maddens? If you think so, then modify its position. Click / Tap the button above to get directions from where you are to Maddens. Best bar in Belfast, or at least that's my opinion, strengthened over the years. Great cráic shared with nice people, locals and visitors! Not a review but a question, please. I am looking for information about my grandfather James McMahon who lived in Berry Street in the early 1900s. Possivly his father ran a pub. Would you by any chance have any knowledge of this family. You can ccontact me at Facebook. What's with the buzzer and CCTV on the door to gain entrance and get out? Surely in Belfast we have moved on beyond that sort of thing. A throwback to the dark times of the 70's. If they're trying to make some Policical capital from it ?, its failing. Just a blooody nuisance, especially for smokers. No need for it. No one is going to shoot anyone anymore. Join the 21st Century, Maddens. they bar you for nothing here! my friend made a comment saying the bar was more of a tourist bar than an original irish bar and got chucked out! laughable really, she was only jesting, but door staff would not listen! barred for life seemly! Went in after the Jools Holland concert and at first it seemed a bit a bit rough but after settling down with a pint and a vino for the missus things began to pick up. Then, Rab and George (I think it was George!?) began to play/sing guitar blues and they were absolutely phenomenal! These boys could play with any blues band in the world and that comes from a Yank born and bred in Sweet Home Chicago who has also spent a lotta time on 6th street in Austin Texas listening to Texas Blues. Brian the owner is an absolute gent who made us feel most welcom and saw us safely on our way home. All in all a stunning 10! Great music, conviviality and a friendly environ. Many thanks to those locals who recommended Maddens to us. Would we come back? Try to stop us! Spent a couple evenings here two weeks ago! Loved it! Had a great time! Enjoyed the atmosphere, the music and the company. Upon approaching though, I told the cab driver I thought perhaps I shouldn't go in. It looked a bit fierce. "no, it's a great place; you'll have lot's of fun." he told me. Then he called over the doormen--three very tall men and introduced me to them. He told them my name and told them to take care of me I was an American. I exited the cab and the driver took off! Next I was informed by the "doormen" that I had to answer their question properly or I wouldn't be buzzed in."wait!" I said. There was no mention of this when the cabbie was at Maddens Bar! They said it's alright, I just had to answer a question properly. (yikes! )"great, ask away!" I said. Their question was "how are you with sarcasm?" I laughed A huge laugh! I had this one I said. My answer? I do well With sarcasm, as a mother of four, it's a service my children provide for free!" They laughed and said I would do fine. They buzzed me in and I had a lovely time for the rest of the evening talking with a widower named Sean and some of his family. Being from the States sarcasm is actually an art form few are good at, yet those that are--are cherished! Go to Madden's have a great time, order the Carlsberg, listen to the music and laugh lot's! Lovely place! Enjoy it! I did! Even if I am just a daft American. Lol! This Bar is to be avoided. The doorman will throw you out for singing (its a music bar). And some of the barstaff are so nasty they will bar you for telling jokes. This used to be a really good bar. Like Kellys around the corner was run into the ground by bad staff and customers( has now redeemed itself once more) This is what is happening to Maddens. Great bar with fantastic live music and a good crowd.Can get pretty packed so get in early, let the disco poseurs go elswhere, this is genuine Irish hospitality at its best.